It’s slowly replacing Scrabble as the de facto party game for anyone who hates trivia and charades. But the newest version of Bananagrams might turn friends into enemies by the end of the night thanks to new random tiles with challenges that encourage players to sabotage their opponents’ word grids. 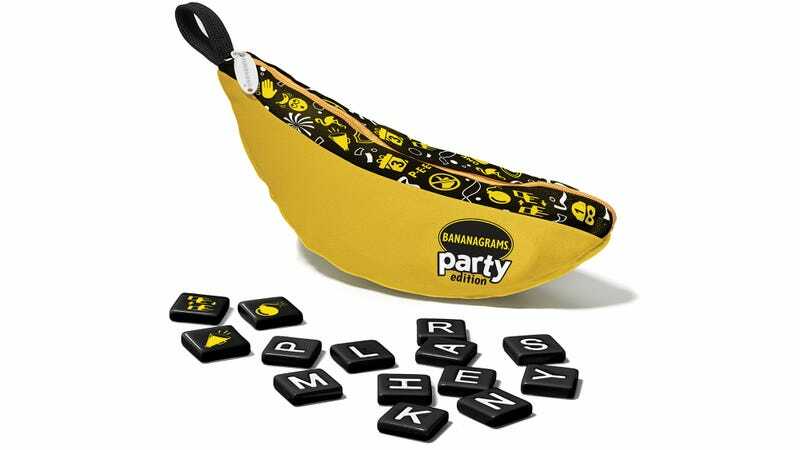 Bananagrams Party is played almost exactly the same as the original version; players race to arrange letter tiles into crossword-like word grids using real words. But the new Party version of the game mixes things up with Party Power tiles that, when drawn, have players racing around the table, tampering with their opponents’ letter tiles, or destroying other word grids. It sounds downright mean, which obviously means it’s going to add another layer of fun when it’s available at Target this summer. And then arriving in the fall is another new version of the game targeted at players as young as five years old. MyFirstBananagrams—which comes in a less-ripened green banana pouch—features special double letter tiles with certain vowels and consonants already grouped together making it slightly easier for kids to spell words with the tiles they’ve drawn. The MyFirstBananagrams letter tiles can also be used to play ten other mini word games that are designed to help children expand their vocabularies and hone their spelling skills so that they’ll soon be able to move up to the more traditional version of the game.